Alecia Goodlow-Young, Raven Brooks, and myself. 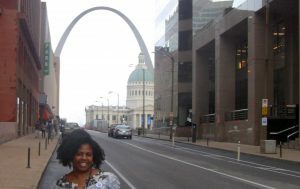 Sightseeing in St. Louis. Photo by Alecia Goodlow-Young. All the cool kids attended the recent Netroots Nation 2016 in St. Louis. It was the perfect place to be trans, a reproductive rights advocate, pushing the climate change conversation, advancing a pro-labor agenda, or leading a march through the streets of the city chanting “Black Lives Matter!” So, of course, the National Writers Union had to be there. Alecia Goodlow-Young and I womanned a booth in the conference exhibit hall, and talked with dozens of writers about the value we get out of NWU. We passed out our literature and buttons, and collected the names and contact info of those we could follow up with later about joining our ranks. While there, I sold my first video story shot in St. Louis about the anniversary of the death of Sandra Bland, and prepared a second story, a Netroots wrap up, also for NBCBLK.com, that did not sell, but check it out anyway. As a first-timer, I was curious about Netroots’ backstory, so I tracked down Raven Brooks, one of the 10-year-old organization’s founders, who said it was created a decade ago out of the frustration of Gore losing to Bush in 2004. The conventions are centered around a theme. Last year they held it in Phoenix. In summer. Where the cool kids nearly melted, but for a good cause: lots of panels that explored immigration and border issues so people could become more informed “for the next time the immigration debate comes up,” says Brooks. Last year, when Black Lives Matter shut down Bernie Sanders’ speech at the Phoenix convention, when he chose not to go on the record about the loss of black life at the hands of police, Netroots responded by focusing this year on racial justice, selecting a convention site only 12 miles from Ferguson, where Mike Brown was killed by police in 2014.